Feeling a bit pudgy? Need extra energy? LAFitness.co.uk can help. With more than 85 clubs and over a quarter of a million members all over the United Kingdom, they want you to know you're not alone. Save on your next workout with discounts and savings found here on VoucherGurus.co.uk. Sign your corporation up with LAFitness.co.uk and your employees can save up to 30%. Join with LAFitness.co.uk now and you won't have to pay anything until January 2010. Check out the Kickstart programme on LAFitness.co.uk and find out how to get your free health check. 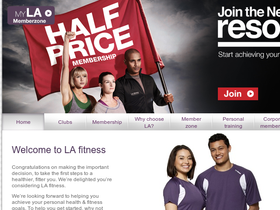 Act now and you can save 15% off select gym memberships from LAFitness.co.uk. Not everyone can do it for a year so try out the 2-month membership from LAFitness.co.uk, now from just £79. Try out the gyms from LAFitness.co.uk for 3 days completely free.